Forget policy, the opening day of the federal election campaign left little to the imagination with politicians up to their necks in personal slurs. A coffee and morning markets is how Bill Shorten started the day, working his way through busy stalls keen to make his pitch to working class Australia. He’s a morning kind of guy but more on that later. 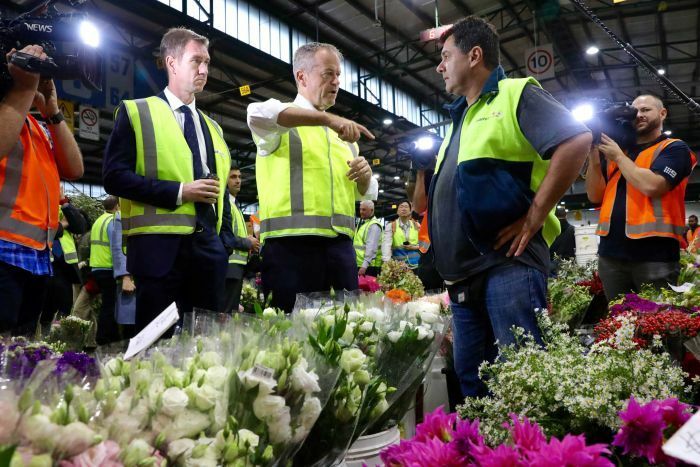 There was no morning bouquet of flowers for the Prime Minister, with his morning starting surrounded by vats of lubricant in a western-Sydney warehouse. Jobs. It was about jobs and not what the cheap jokes might suggest. Irrespective of their location, the messaging from both campaigns was clear and set a tone for what to expect in the coming weeks. A Labor government would equate to letting a pick-pocketer do their best with your hard-earned, according to Mr Morrison. But continued Coalition rule would mean the top end of town could continue to stuff their pillows with cash while “real Australia” forks out more for doctors’ visits and education, according to Mr Shorten. Labor and the Coalition are in the bitter battle over taxes that are so far into the future the government could change multiple times before anyone pays them. 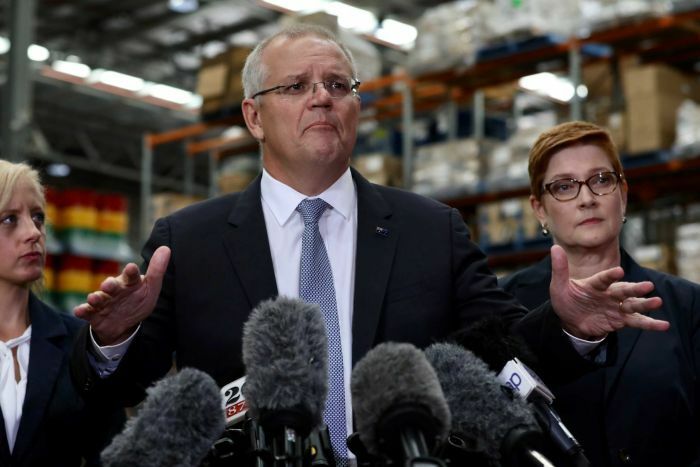 Prime Minister Scott Morrison and Treasurer Josh Frydenberg spent the morning trumpeting a $387 billion dollar tax bill it said Labor would impose on the nation over a decade. The PM and Treasurer had claimed the figure was from the non-partisan federal bureaucracy. But fearing his department was being caught in the middle of political crossfire, the Treasury boss has distanced his boffins from the fracas. Either way, expect to hear a whole lot more about taxes in the next five weeks. Home Affairs Minister Peter Dutton is staring down growing calls to apologise after facing criticism for accusing his Labor opponent of using her disability as an “excuse”. Ali France had her left leg amputated above her knee after a car crashed into her at a shopping centre in 2011. She lives in the neighbouring electorate to the one she’s seeking to represent — something she says will change when she finds a wheelchair accessible home in Dickson. “A lot of people have raised this with me. I think they are quite angry that Ms France is using her disability as an excuse for not moving into our electorate,” Mr Dutton told The Australian. The Prime Minister has defended him and insisted he wasn’t using her disability in a political attack, but rather voicing concerns that had been raised with him. But Labor’s leadership has rubbished that and joined with disability advocates demanding an apology. Deputy leader Tanya Plibersek said Mr Dutton, who she accused of spending more time at his “Gold Coast mansion” than living in his electorate, said he was trying to hide behind anonymous constituents. “I hear from some people that Peter Dutton is a horrible human being — put that on the record,” Ms Plibersek countered. There’s been little time spent flying across the country in the campaign so far with both spending the day campaigning in western Sydney. Mr Morrison appears eager to pluck the marginal seat of Lindsay from Labor. Its incumbent Emma Husar is retiring at the election, a political career she says is ending early because of a Buzzfeed story that she’s now suing the media organisation over. For Mr Shorten, his attention was Reid, another vacant seat thanks to the departure of Malcolm Turnbull loyalist Craig Laundy. The ABC has been tracking the movement of the leaders for the last six weeks to get a sense of where the election will be decided. We’ll keep you posted on where they go and what it means. What we have learned is that Mr Shorten is apparently a morning person. At least, that’s the message he was keen to get to people in Sydney’s markets. Was it legs 11 or was it two fat ladies? The PM spent his first night on the campaign trail ditching his press pack and sinking a pint at the bingo. Although not wanting to have the media with him, the PM’s advisers were keen for the public to know about his evening, sending vision and photographs of the evening to the nation’s media for broadcast. If day one is anything to go by, with or without the media in tow, you’ll be seeing a whole lot more of both leaders. The one thing they both agreed on was there would be no additional government support for Wikileaks founder Julian Assange as he faces the prospect of extradition to the United States. There’s another 36 days to go.